Leverage the robust features of ForeSight® to maximize distribution strategies and automate the illustration sales process for greater business efficiencies, agility and increased speed to market. ForeSight provides carriers advanced features including robust rules, pre-built sales tools and unique system customization to quickly promote products to distribution. Deliver a dynamic and guided illustration sales process, making the complex simple for your sales force so they can deliver products and solutions faster and with more confidence. Deliver anytime access to customized, accurate and compliant sales presentations for all lines of business from one sales illustration system. With ForeSight your sales force can quickly run, compare and illustrate life, annuity, disability, long-term care, critical illness and structured settlement solutions to solve their clients’ insurance and retirement goals. ForeSight provides a single-code-base solution to support both connected and disconnected illustration capabilities, eliminating the need to manage multiple point-of-sale illustration systems. ForeSight harnesses advancement in mobile illustration software by providing system synchronization, keeping your users' information compliant and up-to-date. Advanced configurable reporting and graphical capabilities in ForeSight allow you to emphasize and position product benefits and features with a consistent and compelling look, while meeting your regulatory and compliance department requirements. Create customized output to include product brochures for comprehensive sales presentations. Support unique distribution relationships by delivering a customized, branded interface for each of your distribution channels. ForeSight enables you to manage controls for user rules and rights (i.e., products and product features, system modules, and reports) and enables you to provide each user and user type with individualized sales experiences. ForeSight provides built-in advanced sales concepts that enable advisors to quickly gather pertinent data, perform calculations, and instantly correlate results to specific insurance product solutions to address client needs, while configuring product based on need. Provide distribution point-and-click access to frequently used sales scenarios with configurable templates to create illustrations that highlight distinct product features. ForeSight supports carrier published sales templates and advisor favorite default settings, enabling advisors to illustrate based on defined sales objectives or based on their preferred method of selling. Provide your distribution a single illustration solution that supports individual, family, multi-life (COLI and BOLI) and voluntary group sales scenarios across all lines of business, maximizing sales opportunities. ForeSight creates informative and compelling illustration output to showcase the unique benefits your products and solutions offer. Generate inforce illustrations through unparalleled data capture and transfer capabilities in ForeSight. Through standards-based or custom web services, ForeSight retrieves inforce policy data dynamically to initiate and drive the process. 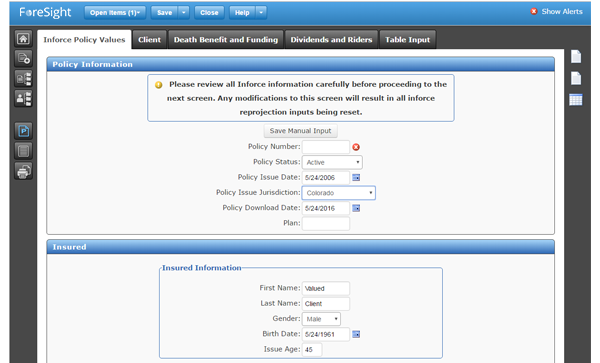 ForeSight supports individual inforce, multi-life inforce and group inforce illustrations in one system. ForeSight allows advisors to simultaneously work on multiple illustrations across different lines of business and products, in a side-by-side comparison view or a composite illustration view for an individual, family or group. ForeSight calculates and combines multiple illustrations into a complete presentation to deliver holistic insurance and/or retirement solutions. Carriers can self-maintain data that changes frequently such as product configuration and rate, availability and features, and account information, in addition to managing onscreen text labels, and clone products to create new products. ForeSight provides a proprietary regression testing solution to expedite and automate testing report output and calculation results. ForeSight® Quick View feature provides comprehensive values for the active illustration in both columnar and graph display formats. 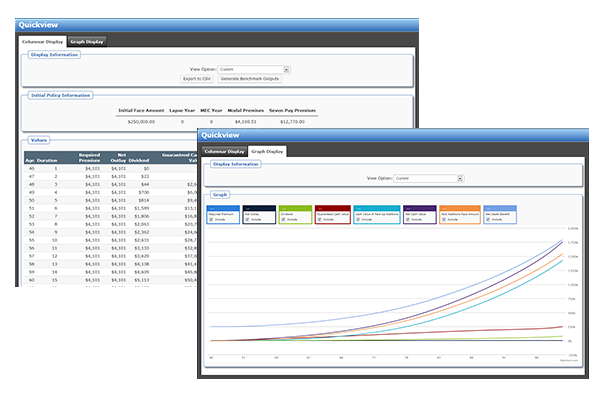 Quick View enables the user to create their own custom view and to instantaneously configure the illustration to depict impacts of changes. 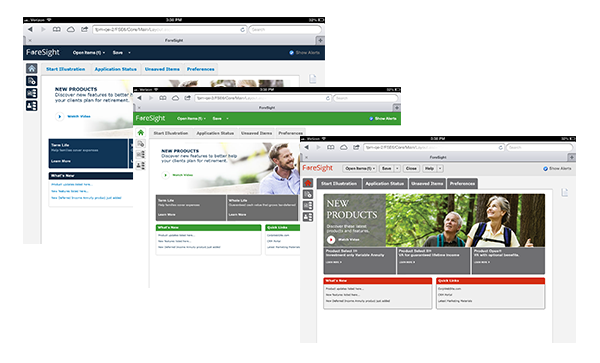 ForeSight architecture is easily integrated with other systems including Policy Administration for new and inforce, CRM (Salesforce, Microsoft Dynamics, Redtail, and more), multi-carrier quoting, new business/underwriting and e-application solutions including FireLight®, simplifying the sharing of data and status for an integrated sales experience. Taxation: Excludable, After-Tax Income and comparison, etc. ForeSight® provides a single-code base solution to support both connected and disconnected illustration capabilities, eliminating the need to manage multiple point-of-sale illustration systems. ForeSight can be deployed on both the web and desktop with full system based code and case synchronization. ForeSight® sales illustration software empowers your distribution to support individual, family, multi-life (COLI and BOLI) and voluntary group sales scenarios across all lines of business, supporting all selling situations. ForeSight creates informative and compelling illustration output to showcase the unique benefits your products and solutions offer. 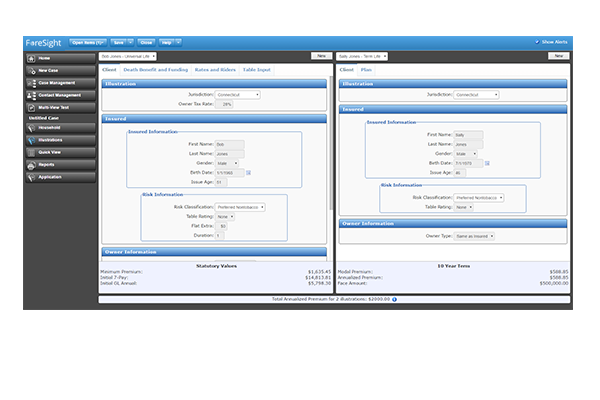 ForeSight® provides the ability to run AND OR illustration scenarios. ForeSight allows users to simultaneously work on multiple illustrations either in a side-by-side comparison view or a composite illustration view of all the contracts being proposed for either individual, family or group. 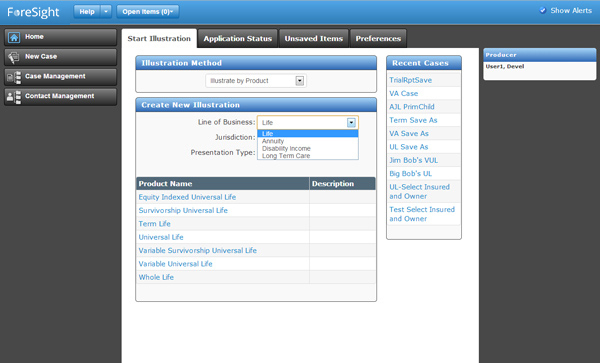 Side-by-side illustration view can be used across different lines of business and product types. ForeSight calculates and combines multiple illustrations into a complete sales presentation that presents a holistic insurance and/or retirement solution that best meets the clients’ needs. ForeSight® preset sales strategy templates provide simple point-and-click access to frequently used sales scenarios as defined by your home office. Provide your producers the tools to illustrate the most powerful and competitive features of your products while meeting compliance requirements . ForeSight® harnesses advancements in mobile point-of-sale illustration software by providing system synchronization, keeping your users' information compliant and up-to-date. 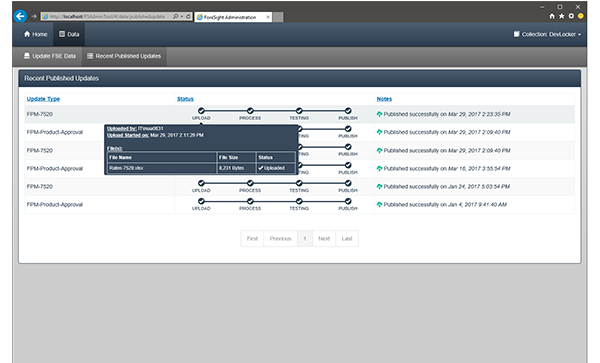 ForeSight automatically version checks and incrementally updates disconnected systems when connected to your portal, updating only files with changes. 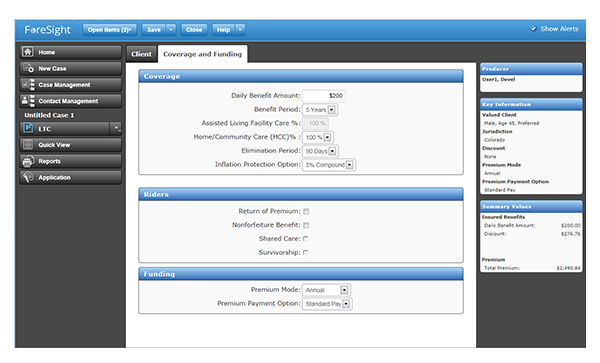 ForeSight® preset sales strategy templates make experienced reps more efficient and novice producers instantly productive for multiple lines of business (Life Insurance, Annuity , Long Term Care, or Disability Income illustrations). Published templates allow carriers to create multiple set of defaults for products, expanding use case of product and solution selling. 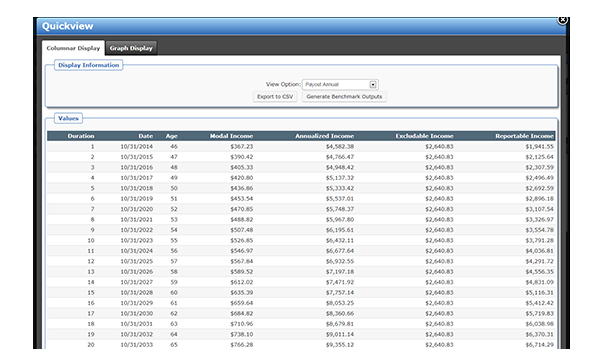 Enable your sales force to illustrate based on sales objectives with configurable templates. Provide your distribution partners point and click access to frequently used sales scenarios in ForeSight to create compelling and compliant illustrations that highlight the distinct and competitive features of your products, according to your compliance standards and rules. Advanced configurable reporting and graphical capabilities in ForeSight® allow you to emphasize and position product benefits and features with a consistent and compelling look, while meeting your regulatory and compliance department requirements. Create desired customized output to include product brochures from your website for comprehensive sales presentations. Illustrate product values through line, bar, pie or stacked graphs. ForeSight® Admin Tool provides the ability to self-maintain data that changes frequently such as product configuration, availability and features, account information, and product rates. ForeSight Admin Tool allows you to quickly control and update rates and jurisdiction approval data, and clone products to create new products based on existing product configurations. Carriers can easily manage multi-lingual and onscreen user text labels within the Admin Tool. 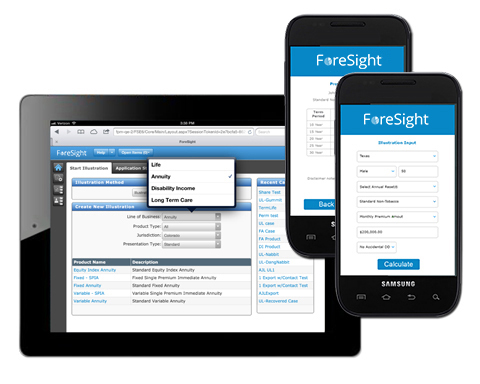 Carriers can leverage the ForeSight Admin Tool to schedule and instantaneously make rate updates on products illustrated in both ForeSight and FireLight® Illustrations. ForeSight® architecture is easily integrated with other systems including Policy Administration, CRM, multi-carrier quoting, new business/underwriting and e-application solutions including FireLight®. The integration between ForeSight and FireLight enables the sharing of data and statuses, binding the illustration to the application for an easy integrated sales experience. This integration also provides carriers a unique opportunity to create a single and cohesive signing ceremony for illustration and e-application processes.